The Measure M half-cent sales tax hike goes into effect July 1 and a new report is calling for cities in southeast Los Angeles County to use a large share of the proceeds to make streets safer for pedestrians and bicyclists. Titled “Southeast Cities Measure M Local Return: Creating People Friendly Funding Priorities,” the report details poor street conditions in the cities of Bell, Bell Gardens, Commerce, Cudahy, Huntington Park and Maywood that could be improved using Measure M revenue. The report was released last month and is co-written by East Yard Communities for Environmental Justice and the southeast-based advocacy firm Urban Health Strategies, with support from the Los Angeles County Bicycle Coalition and Public Health Advocates. “These communities need land use [and planning] that caters to bicyclists and pedestrians alongside vehicles,” says the report’s lead author, Bryan Moller. “It’s definitely tougher to incorporate the goods movement” that heavily impacts the region with a bike infrastructure, Moller acknowledges. The nonprofit sponsors hope to convince the six southeast cities in the study there is much to be gained from committing 100 percent of their Measure M money for the next 10 years to “people friendly” improvements like dedicated bike lanes, sidewalk construction and widening and safe routes near schools. These types of improvements will make the region – which includes some of the most densely populated cities in the country – more livable and interconnected, especially in communities where heavy truck traffic is the norm, states the report. A portion of the added sales tax revenue will be returned to the county’s 88 cities and unincorporated areas, using a funding formula based on population size. The remainder will go to fund Metro projects throughout the region. Cities can use the funds for transportation projects such as local bus service, street and pothole repair, traffic signal synchronization, sidewalk repairs and bike lanes. Although many southeast area city officials criticized Measure M’s funding formula as unfair, voters in the area overwhelmingly approved the measure back in November with a 70 percent margin. Commerce, one of the more vocal opponents to the measure, argued it would be decades before southeast residents benefit from the added half-cent sales tax. They pointed out cities along the SR-710 corridor would receive less in tax proceeds even though their streets suffer the brunt of the damage caused by the region’s goods movement. Nonetheless, “Local return is a huge opportunity for cities to create a sustainable funding source to plan and construct people friendly active transportation improvements,” according to the report. Dedicating 100 percent of the new tax revenue to the types of street projects outlined in the report may seem like a lot, says Moller, but for cities like Commerce, which will receive only about $300,000 a year, the cumulative, 10-year total is far below the estimated $20 million in infrastructure repairs needed in some cities. That’s why it’s vital that these cities collaborate to ensure continuity, he added. While all the cities have a well-connected sidewalk network, according to the report, central businesses districts in those cities lack pedestrian-friendly improvements that would make streets more walkable and less congested. It goes on to state that of the 175 collisions between vehicles and pedestrians or bicyclists in Bell Gardens between 2012 and 2016, seven resulted in deaths. In nearby Commerce, 56 collisions occurred during the same timeframe, with 11 fatalities. Moller said he hopes the southeast cities will follow the example of the city of Los Angeles, which has adopted “Vision Zero,” a master traffic safety policy that aims to eliminate all traffic-related deaths and serious injuries by 2025 through strategic investment in engineering, evaluation, enforcement and education. Moller says the six southeast cities identified in the report should implement master transportation plans that are interconnected. There are currently no dedicated bike lanes in any of the cities, however, the Los Angeles River Bicycle path does run through Bell Gardens, Cudahy and Maywood. In Commerce, that means “you have 18-wheelers blowing air into the faces of the bicyclist riding alongside them,” Moller points out, adding that building barriers to separate trucks from bicycles is the only way to change the situation. Commerce Public Works Director Maryam Babaki told EGP the city received a $250,000 grant earlier this year that it will use to create a master bike plan, and said the city will likely use its Measure M tax proceeds to support the effort. “A community that is walkable and bikable does enhance the quality of life,” Babaki said, adding that being an industrial city does create challenges. “It takes a lot of planning and creative engineering,” Babaki said. She argues that Commerce is actually ahead of the game, noting that the city is moving forward with street improvements along the Atlantic Boulevard corridor. 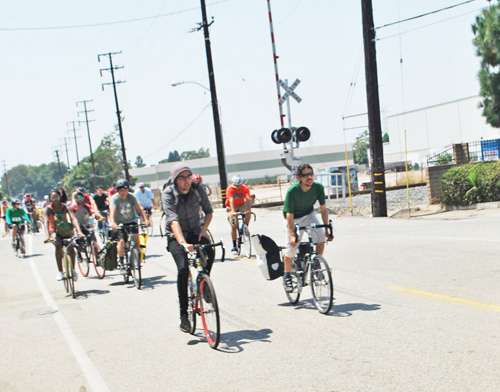 Bell Gardens Public Works Director Chau Vu told EGP the city does not currently have a bike plan in place, but will use a recently awarded $160,000 grant to begin the planning. Two years ago, Bell Gardens joined with other southeast cities to solicit grant funding to pay for a regional transportation master plan, but they were unsuccessful. “It’s just been a lack of funding, it take a lot to put together a master plan,” Vu said. She said the city is considering using Measure M monies to improve traffic at the intersection of Eastern and Florence Avenues, which could include street widening and adding turn lanes. The nonprofit coalition behind the report wants to see the cities commit the first two years of added sales revenue to the types of infrastructure improvements that will improve safety for pedestrians and bicyclists. Their goal is to help cities understand that a master bike plan is about more than recreational biking and more to do with making streets friendly for everyone. “We want it to be just as easy for a bicyclist to get to school or work as it is for a grandpa to walk to the store,” said Moller.